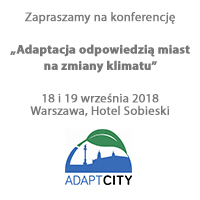 We will contribute to increasing the awareness of climate change, including the need to adapt to climate change, among the authorities of Polish cities – we estimate that in surveys conducted at the beginning and at the end of the project the number of answers given by representatives of the municipal authorities acknowledging that adaptation to climate change is an important or very important task will increase by 5 percentage points. We will mobilise Warsaw inhabitants to become involved in initiatives focused on adaptation of the city to climate change – we are counting on local grassroots initiatives! We will contribute to the adoption and implementation of the strategy for adaptation to climate change by the Warsaw authorities. – the heat island maximum difference between the city and its outskirts will be reduced by 1°C. We will encourage at least three other cities in Poland to develop a strategy for adaptation to climate change with the use of the climate map or other instruments and at least two other cities to introduce other climate change adaptation solutions implemented in other LIFE+ projects. We will contribute to increased interest in international climate protection and climate change adaptation initiatives among Polish towns and metropolises – at least three new cities in Poland will join the Covenant of Mayors and at least one city will join the EU Climate-ADAPT.